Simplicity naturally found its way into our kitchen so we have been enjoying more simple meals. Less gourmet and more simple satisfying ways to feed the growing bodies in our home. We’ve introduced a few meat-free meals into the week and lunches have become more streamlined because let’s be honest, my three-year-old doesn’t need seven different containers of mini snacks between 9am and 3pm. Food should sustain us not be cause for panic or hours in the kitchen. In saying that, I’ve been using the extra space and time to get back to some of the things I enjoy like baking, using fresh herbs and spending a little extra time on making something really yummy now and then. This post focuses on lunchbox treats. Whether it’s for kids or yourself, packing a healthy lunch will save you hundreds of dollars per year and you’ll have the satisfaction of knowing exactly what’s in it. You can check out my post on adult lunches here. Vegetable snack: carrot sticks, cherry tomatoes, snow peas, beans, avocado, any raw or cooked veggies. Fruit snack: her fave is strawberries, and if it’s the end of the shopping week a few sultanas or dried apricots. Dairy snack: usually the standard is Famers Union Greek Vanilla Bean Yoghurt in a little container (its waaaay less sugar and ends up being half the price of the little sachets. I do up a stack of little containers at the start of the week then they are portioned ready for easy access each day). If it’s not a yoghurt then I’ll add a little milk or a cheese stick—check the ingredients as you should be able to get cheese that only contains milk, salt and cultures, no numbers or additives. Of course, my mummy guilt will try and tell me that I should avoid processed foods, she has too much dairy and there should be more fresh stuff in there but…. For now, this works, I don’t need to think about it too much and it is easy and sustainable. Sure there are better options but there is a whole lot worse I can do too. The best thing is that because it’s a simple pattern both my girls (ages four and six) have started packing their own lunches using a drawing I quickly drew up before going away for work a few months ago. My efforts were to help my husband out but the girls did it so well it’s just stuck. One of the easiest ways to save money and cut down on the packaging is to portion out in small containers. You can do this at the beginning of the week with not too much trouble then it is simple for the rest of the week. We do it with crackers, corn thins, yoghurt, cheese cut from the block, protein balls etc. 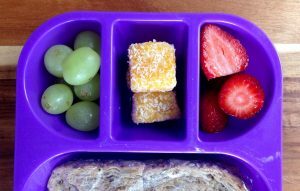 For more info on making lunches for older children or yourself check out this post: Packed lunch: fresh and healthy and made in under two minutes. That’s all from me. Next post will be about demystifying the family dinner whoop whoop!